It’s hard to believe that it is less than 30 days until the start of the 2012 London Summer Olympic Games. The Olympics have always held a special place in my heart. Even from a young age, I remember making the Olympic rings with my cheerios as I ate breakfast, although I didn’t truly understand their significance. To elite athletes vying for that coveted Olympic spot, an Olympic year is different than any other year. It’s the time when you know all the hard work from the past 4 years will culminate and be tested. It’s stressful, grueling and exhausting. I witnessed these emotions as I watched the swimming Olympic trials on TV last night. As the swimmers stepped onto their starting blocks before the final race, their faces told a story that I knew all too well. The pressure, the anxiety, the butterflies. They are feelings you’ll never forget. I watched their faces when they realized they made the Olympic Team: feelings of relief, happiness and disbelief all rolled into one. One swimmer’s Olympic dream was determined by a mere two-tenths of a second! As I saw her run into her mom’s arms with tears streaming down her face, I remembered how I felt the day I achieved my Olympic Dream, in June, 4 short years ago. It seems like a distant memory, but also like it was yesterday. A lot has changed in those 4 years, but I will never forget my Olympic experience. Before I went to Beijing my father told me that the experience will change me and he was right (he usually is). I got to meet and experience things that only a select few have. How can you explain to someone what it’s like to walk into the Opening Ceremonies with 90,000 people cheering for you? How can you explain to them what it’s like to step onto the mat, look across to your opponent (a 5-time Olympic Medalist, 7-time World Champion) and know that you deserve to be there? Those are experiences that will never fade with time and that define who I am today. As I look back at that time, I feel proud, but also extremely grateful. I think I am only now beginning to understand what kind of sacrifices people made to help me achieve my dream. To be a great athlete you have to be selfish. But at the same time, to be a great athlete you need to have so many un-selfish people around you, willing to help you achieve your goal. 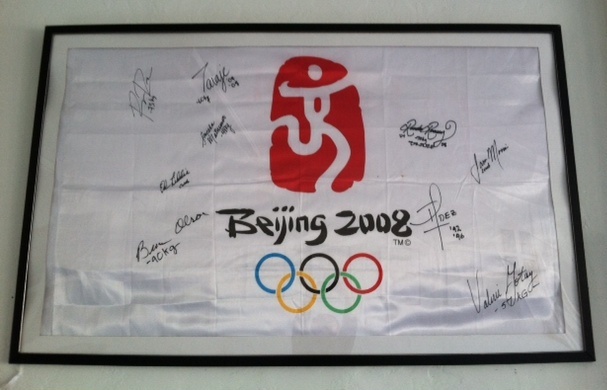 It is to all the people who helped me get to Beijing that I dedicate this post. To my father and family, whom I will never be able to repay (literally and figuratively) for all the time, money and effort they spent on my dream. To my dojo, who allowed me the space and support to workout. To my training partners and teammates who encouraged me when I was down and took countless falls and uchikomis. To my strength and conditioning coach who gave so much of his own time without asking a nickle in return. To all the people who wrote me emails during my journey- thank you. You may not know this, but I have kept every single email that I received while I was in China. Occasionally I will go back and read through them and it brings tears to my eyes to know how many people from all over the world supported me. I am truly blessed to have had the opportunity to travel the world and have the experiences that I have had. Continuing on, I can only hope that I can give back a fraction of what I have received from all of you. Thank you so much for your endless support in me, my family and my dojo! Beautifully written and wonderfully reflective. What an amazing experience. Thanks for sharing. I am touched and inspired by your truly heartfelt words. I was blessed with the opportunity to be a part of your experience. I appreciate and will always cherish the memories I have of that experience.Those memories will remain with me forever.